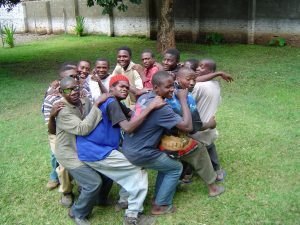 Read Part 2 of the Hoover’s blog post about the Big and Little Nephews in Zambia that they care for with open hearts! We described how we met the “call boys” or our “nephews” (ages 25-35 years old) in the last blog post. People often wonder how we then came to have our large group of “Little Nephews” (ages 8-24 years old). Bring they did. The nephews marched many dozen young boys into outreach and stoically stood behind the young boys to say, “You need to hear this. Listen to what they are teaching.” They themselves were silent. They wouldn’t share their hearts or lives openly in front of younger boys. A decision had to be made. We told them that the outreach wasn’t working if they were not a part of the activities and conversations. We called for a vote to see if everyone was in favor of splitting them into “Big Nephews” on Fridays and “Little Nephews” on Wednesdays. They were evenly divided in their decision, but one of the CWO staff broke the tie in favor of them splitting. Thus, the “Little Nephews” were formed. While speaking with them we learned that they were not in school and they idolized the “Big Nephews” because they didn’t go to school, didn’t answer to anyone and were totally independent. We counseled them and soon a wave of peer pressure swept through the group to the point all of them wanted to return to school. Over the past 12 years we have seen the blessing of meeting these “Little Nephews” at a young age. 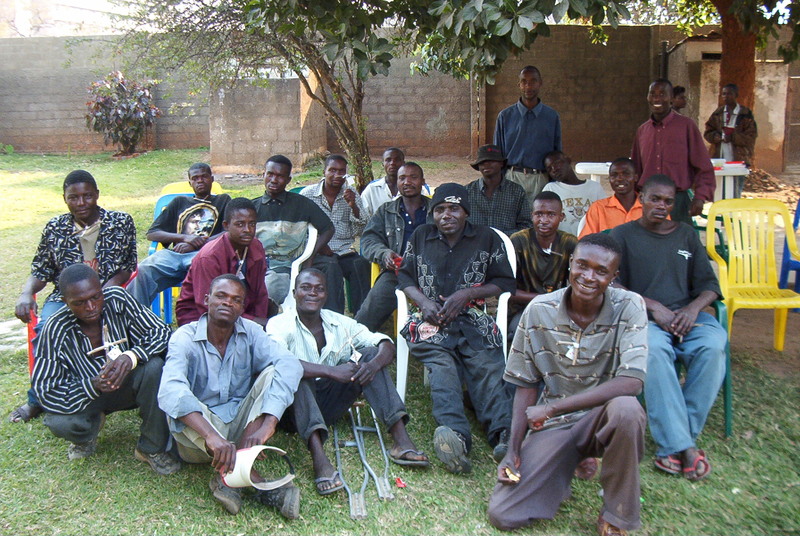 The Lord allowed us to meet them before it was too late for them to return to school, as it was for the “Big Nephews.” The school fee assistance brought about the need for tutoring and then we expanded into discipleship on Mondays, English classes on Tuesdays, Outreach on Wednesday, Bible study on Thursdays and activity days on Fridays. Soon health care assistance, dental assistance, nutritional assistance and the ability to bathe and wash clothing were clear needs in their lives. We now touch every aspect of the boy’s lives: physical, emotional, nutritional, and spiritual. These “Nephews”, Big and Little, are our beloved family who allow us into their lives in very real ways. We are grateful to be a part of their lives and to have them be such a big part of ours! Bill & Marci Hoover have lived in Zambia as CWO missionaries since 2002. We are honored to publish their two-part blog post about their family of Big & Little Nephews and how God is working through them. Watch for part two in July! We had no doubt we were called to Zambia in 2002. God could not have been more clear. 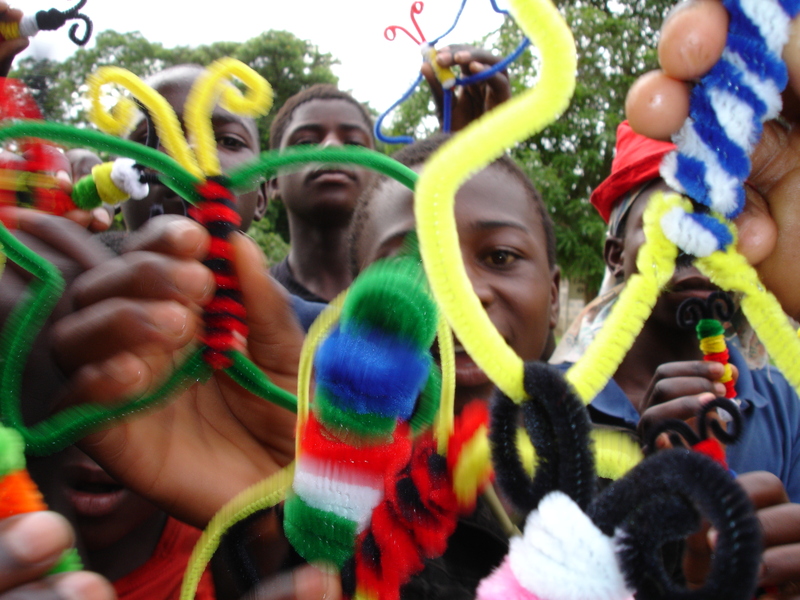 We arrived with the intention of teaching HIV education and prevention, but the Lord had another plan too. We rented a flat that had a mini-bus station right in front of it. As we’d go out to catch the bus, we got acquainted with the young men who are called “call boys” because they take it upon themselves to “call” people to the buses. These men are typically drunk and don’t hesitate to fight each other for any tips thrown out by the bus conductors. Their goal is to obtain the equivalent of $1 each day so they can have one meal. It seemed to us that these men wished to share their hearts with us, but not in front of each other. We decided to invite all of them to our CWO office for a barbeque so they would know where to find us if they wished to talk. We asked for all of their names so invites could be printed up and they were very excited! They asked about their invite daily until they were received! No invite, no admission was our policy. The day arrived and all 25 young men walked through the gate freshly bathed with invite in hand…outside of one. 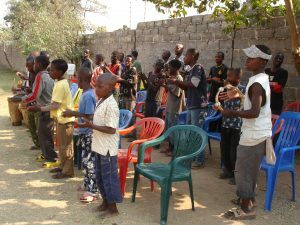 We had a joyous time together playing games, eating, and watching the Jesus Film in their local language. At 4 p.m., when their bus station was busiest, we thanked them for coming and said, “Now you know where to find us! You are welcome here anytime!” The guys didn’t budge. We asked our translator why they weren’t leaving and she didn’t know. Marci felt compelled to ask them, “If CWO could do anything for you, what would it be?” The translator was very hesitant to ask the question believing they would ask for money. Marci felt even more compelled and insisted the question be asked. It turns out that each bus station is its own gang. You don’t mix the guys of different stations together. The leader of this station was Big George at that time. Big George stood up and said, “Ok, #1. We don’t know how to read so we don’t know what the Bible says. We know that the way we are living isn’t pleasing to God, but if you could teach us what the Bible says, we’d be grateful.” Marci said, “We can do that.” He continued, “#2, our families and society talk down to us and criticize us all the time. If you could encourage us, we’d be grateful for that.” Marci again said, “We can do that too.” Lastly he stated, “#3, if you could get us a new job, we’d be very grateful. Our jobs are so demeaning that we get drunk just to do the job. If you could get us new jobs, we’d be grateful. BUT, please don’t give us the job first. Teach us the Word of God, encourage us to change, and then when you’ve seen us change, give us a new job. If you give us the job first, our alcoholism will ruin it.” Then Big George sat down. We committed to helping with those three things in their lives. Before leaving, one of them yelled, “When are we doing this again? !” We quickly calculated the cost of the lunch and activities – having thought this was a one-time thing – and suggested they come in two weeks. They agreed with cheers as they ran out the door. That was in January of 2003. We have met with the same group of men (minus the 15 we have buried) every other Friday since then. We have added some men through the years and some have shifted to other towns, but we are still a tight knit family who loves each other through the sorrows, the challenges, and the joys of life. Most importantly, they have experienced (and tested!) the unconditional love of Christ at CWO and found freedom in His love. We call these men our “nephews” because we are called their “Auntie and Uncle”. It only seems appropriate…and makes it clear we are a family. We cannot think of a more rewarding “job” to be given than this. Each day we get to love those who feel unlovable, and in the process, help their eyes be opened to the truth and love of our Savior, Jesus Christ.